The number of railway sleepers required to be placed under the track per rail length is called as its railway sleepers density. In Pakistan the sleeper density varies from n + 3 to n + 7. In America, the sleeper density from n + 9 to n + 11. 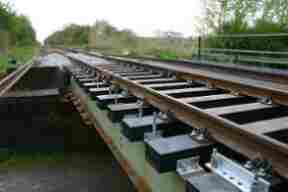 The stiffness of a track is increased by increasing weight of rail or by increasing the railway sleeper density and the adoption of either one or other methods depend on comparative cost of rails and railway sleepers. The sleeper density cannot be increased indefinitely as a certain minimum distance is required between the two adjacent sleepers for packing ballast. In case of staggered joints on cure an extra sleeper is to be put up as sleepers are to be provided on either side of joint. All sleepers need not be placed at equal distance apart. Sleepers at rail joints are placed nearer and also some two or three railway sleepers near the joint sleepers are spaced closer than the sleepers in the remaining length of rail.